So many times Canadians are excluded from candy giveaways and contests, but not this time! Tic Tac Canada has launched their â€œSmall Fun Revolutionâ€ campaign. 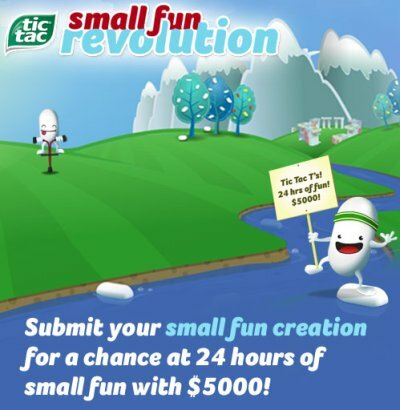 They are encouraging Canadian Tic Tac candy fans to submit their own small fun creation for a chance at 24 hours of small fun with $5000! Create a video or photo of something made out of Tic Tacs or Tic Tac boxes and submit it at tictacsmallfun.ca for a chance to win the grand prize, 24 hours of small fun with $5000. Creations will be judged on originality, creativity, and of course, overall fun-ness. Also, the first 1000 entries get a free t-shirt from Tic Tac. For more information, visit tictacsmallfun.ca. They have already seen Tic Tac artwork, buildings and contraptions â€“ the possibilities for creativity are endless! And, for everyone that owns an iPhone – you can download two different FREE Tic Tac games for the iPhone and if you finish all the levels (and live in Canada) you can win a free t-shirt! (non-Canadians just get to play some free, fun iPhone games. We always like it when candy companies help out good causes, and this is no exception. For every game of Tic Tac Toe that is played, Tic Tac will donate $1 to CancerCare, up to $5000, in addition to the $100,000 donation they’re already making. I have no doubt we can reach that $5000 limit pretty quickly! Plus, if you happen to be in Times Square on August 19, Tic Tac will be attempting to set the world record for the most Tic Tac Toe games played at one time. It’s all part of a larger partnership with CancerCare to raise awareness of the effect cancer can have on everyone, including friends and loved ones, those fighting the disease, and health care providers. So what are you waiting for? Go play some Tic Tac Toe already! Tic Tacs have never been my favorite mint â€“ they’re just too wimpy for my tastes. Iâ€™ve always preferred mints that are strong enough to make my tongue sting. I like the mellow vanilla outside of the white mint ones, but to me it doesnâ€™t really go with the minty center, and the orange-flavored ones were just another fruit and mint combo for me to dislike. 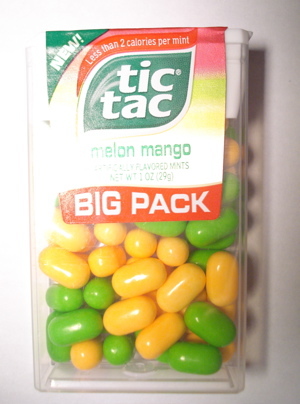 I havenâ€™t had a Tic Tac in years, but it seems like theyâ€™ve really expanded their flavor lineup â€“ including this brand-new flavor combination, Melon Mango (two flavors in one!). Armed with a hefty Big Pack courtesy of the All Candy Expo, I endeavored to see if my opinion of them would be improved by these new flavors. If SweeTarts made a small, nondescript cherry version of its candies (in the shape of an engorged Tic Tac), they’d taste just like the Tic Tac Chill Exotic Cherry. Not bad. Not great. I like the tartness, but there’s not much “cherry” going on here. Surely nothing exotic. Now, I haven’t tried the Paradise Mint, but there’s no mention of breath-freshening on the Exotic Cherry, so I consider these straight candy. Except that candy and sugarfree sound like Punch and Judy to me: they don’t tend to get along in my puppet theater. But at least these Tic Tacs aren’t sweetened with aspartame; they have the much better-tasting xylitol. This sugar substitute also reduces dental plaque, supposedly, by attracting bad microorganisms to itself – then starving them to death because it’s not a real sugar they can use. Tell me about it. 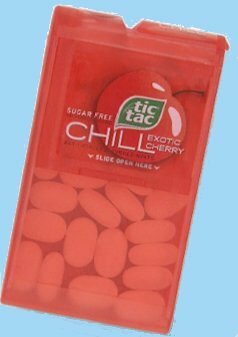 But hey, if you want to trick your mouth and get a fairly weak cherry Sweetart-esque experience in a small package, Tic Tac Chill Exotic Cherry might be just the ticket. Don’t expect any high cherry drama, though. The new Chill varieties of Tic Tac will be hitting shelves soon. “Oohh, cool! 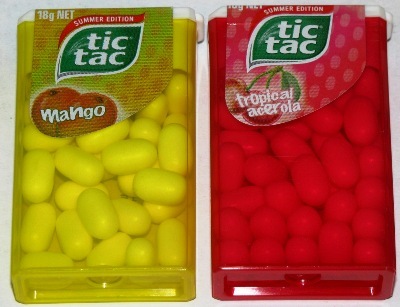 New Tic Tac flavors! I think I might grab one of these mango ones… and one of these… wait! What? What the heck is a Tropical Acerola? How do you even pronounce acerola? Ahh, who cares, best buy one anyway.” That was pretty much the conversation I had in my head as I found myself looking at these “summer edition” Tic Tacs. Having never tried an actual acerola, I can only say that the Tic Tac version is quite nice. It actually tastes like a cross between raspberry and mint, with a decidedly “hot” feeling on your tongue. It works really well as a more gentle type of mint with an added dash of the tropical, and it really did have a summery taste to it. Mango is one of those flavors which I think is very hard to reproduce in candy – a bit like banana, you never really get a true fruit flavor coming through. This one, like the acerola, is slightly spicy in nature. The first taste is actually pretty mango-ish and the flavor stays around for quite a while. While neither of these set my world on fire, they were nice additions to the Tic Tac flavors already out there. Given that it’s currently winter Down Under, they served as a nice reminder of days by the beach and drinks by the pool. Now if only I could somehow convince Candy Addict to sponsor an acerola tasting trip to the West Indies….